Infectious Disease and Critical Care Internal Medicine, Vancouver Coastal Health, North Vancouver, BC, Canada. Wound cleansing is the most ubiquitous method to maintain optimal wound hygiene as it is available at all clinical settings and skill levels. The periwound is often a neglected area, but serves as a source for microbial recontamination if not adequately cleansed. 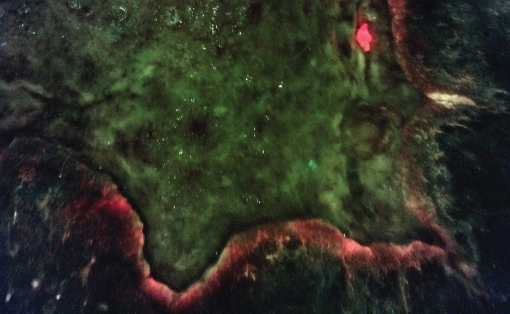 Fluorescence imaging has been used to visualize red-fluorescing, pathogenic bacteria in the wound bed and periwound area at the bedside using a non-contact, hand-held device. 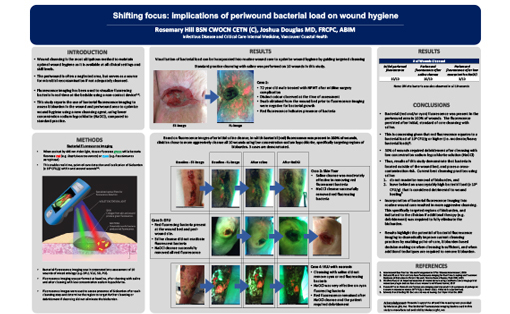 The visualization of bacterial load can be incorporated to optimize wound hygiene by guiding targeted cleansing and debridement. Recently available improved skin and wound cleansing agents with lower concentrations of sodium hypochlorite, which are purported to disrupt biofilm and kill planktonic bacteria while still safe for the wound bed, may optimize wound hygiene. Effectiveness of such cleansers compared to standard practice is reported here. In this series of 10 patients, bioburden reduction was assessed by fluorescence imaging and visualization of bacterial load. The wound bed and periwound area were cleansed using saline or 0.057% sodium hypochlorite. 9/10 patients had bacterial load present outside of the wound bed. Periwound/wound cleansing with traditional saline was not sufficient to remove bacterial load from 9/10 patients. Low concentration sodium hypochlorite was effective at eradiating the bioburden from 6/9 patients, however 3/9 patients required debridement to fully eliminate the bioburden. Timely management of wound bioburden is imperative to support overall healing. Wound hygiene can only be possible if the location of bioburden is identified in the wound/periwound area and removed with effective cleansing agents.